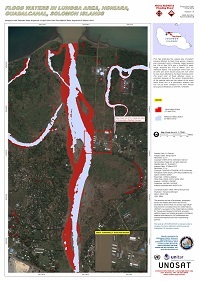 This map illustrates the Lungaa area of eastern Honiara affected by flash flood waters. Analysis was conducted using a Pléiades image acquired the 13th of April 2014 and a TerraSAR-X radar image acquired the 07th of March 2013 for reference waters. The expansion of the river can be seen and some houses along the river seem to have been affected by the flash flooding event. The exact limit of flood affected zones is uncertain because of the sensor characteristics of the satellite data and the nature of the event (flash flood).This is a preliminary analysis and has not yet been validated in the field. Please send ground feedback to UNITAR / UNOSAT. Copyright: CNES (2014), Distribution Astrium Services/Spot Image SA, all rights reserved.